This is not a post about critical analysis, material culture, or storytelling. This is a post about holy paladins. This is a post for holy paladins who like playing holy paladins, and want to explore Azeroth as holy paladins. Okay, we’ve gotten that out of the way. While I’m always going to be Catulla at heart and still have plenty of things to do on her, after 5 years of playing as moonkin DPS I’ve put away my raiding antlers and picked up a sparkly golden hammer. (I blame the switch on the fact that Waypoint’s Herald of the Titans effort needed a healer, but then I blame Waypoint for a lot of things.) 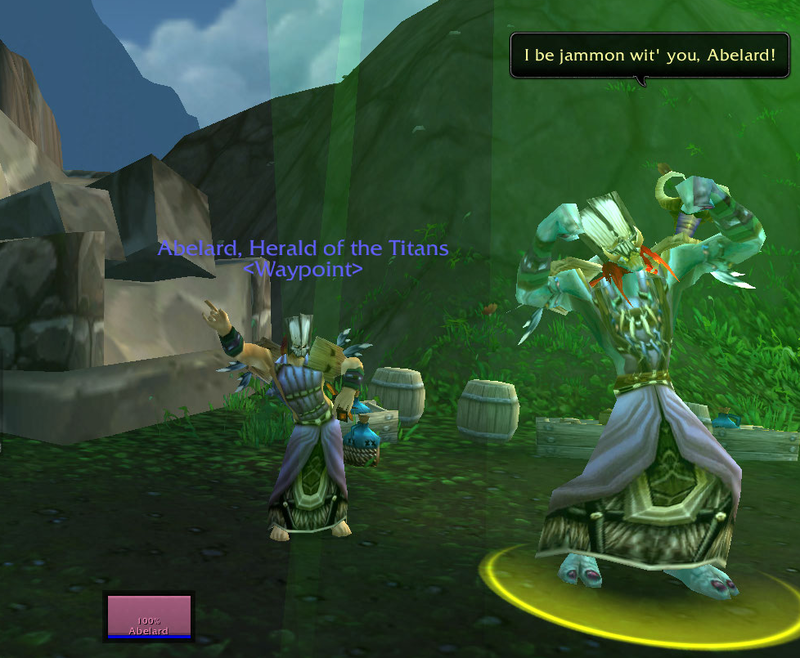 When Mists was released, I wasn’t particularly keen on leveling in Pandaria as Ret or Prot. Just personal preference — nothing against either spec. So, I looked at the new 5.0 class changes, thought “hmm, there’s awful lot of offensive capability in these abilities that’s probably here for a reason”, slapped some talents and glyphs together, and accidentally fell in love with being a shockadin. And then I wondered, why are more people not talking about playing shockadins? This is fun as hell. I leveled to 90 as holy, I do my dailies as holy (just hit revered with Golden Lotus today), no regrets. NO MERCY. Holy Shock – buffs the damage of HS. Denounce – occasional reduced cast time; handy, you’ll be spamming it a lot. Harsh Words – turns Word of Glory into an offensive spell when used on a hostile target. Righteous Retreat — are you seriously saying no to the Bubble Hearth glyph? What kind of paladin are you? Terrible. The others are largely cosmetic, take your pick. I personally like Fire from the Heavens for maximum KILL IT WITH HOLY FLAME. Fist of Justice – reduced cooldown on one of your interrupts. This will make your life doing Golden Lotus dailies much easier. Sacred Shield — mostly because Selfless Healer doesn’t have any utility for solo questing and Eternal Flame doesn’t work with the Harsh Words glyph and besides, EVERYBODY LOVES BUBBLES. Unbreakable Spirit — reduces cooldown on your DS/LoH/DP, but honestly, I think any of the talents in this tier would be useful. Go with your preference. Divine Purpose — when it procs, you can basically spam the equivalent of 3-HP Harsh Words at no cost. I like Divine Purpose because it’s passive and thus one less CD to think about while questing (as opposed to Holy Avenger). I would typically get two Harsh Words out of this, but sometimes up to 3 or 4. Sanctified Wrath has some nice aspects, but as a lot of its benefit is tied into using Avenging Wrath, it’s basically a buffed panic button. I want something that has a chance to help me constantly, not just when I get into trouble. Light’s Hammer — a handy little bit of simultaneous self-heal and aoe damage, particularly when you’re doing That Sprite Quest in Mistfall. Use Holy Shock to build HP just as if you were healing; as with most paladin specs, use your HP-sensitive spell (Harsh Words) at 3. Sometimes, if I was going in for a mini-boss or named quest mob, I’d try to build up 5 charges by healing myself or killing a less powerful mob and hope for a Divine Purpose proc. Spam Denounce when you can’t do anything else. Hammer of Wrath when applicable. You can obviously use Crusader Strike to build HP as well, but bear in mind it will hit like a wet noodle. Use your other cooldowns as you normally would. Sparkle and be GLORIOUS at will. OKAY FINE WHATEVER BUT SERIOUSLY, IT TAKES YOU LIKE FIVE MINUTES TO KILL A MOB, RIGHT? Actually, no. I even timed my 12 mogu kills for my Golden Lotus daily today, FOR SCIENCE. The longest kill was 38 seconds, and the shortest was 24, with an average of 31.9 seconds. It’s not going to top any meters, but it gets the job done in the spec I have superior gear in. I didn’t use Avenging Wrath on any of these mobs, and all of them involved judicious (see what I did there? that’s a PALADIN PUN) use of interrupts for abilities like Shield of Souls. I have an average ilvl of 463, but I haven’t optimized my gems/enchants/reforges yet. I also had the Tangy Yogurt haste food buff and Blessing of Kings. I was not fighting any other mobs for any of these kills. I thought about doing some target dummy practice and spouting some numbers out, but this isn’t a build that’s viable for sustained, raid-worthy DPS. This is a build to get you through your dailies in a reasonable amount of time without dying. Aside from Light’s Hammer, the build doesn’t really have any strong aoe damage. I mostly pull one mob after another assembly-line style and save my panic buttons for when I accidentally aggro too many. I can *survive* several mobs (of course I can, I’m a paladin, I’m indestructible), but it isn’t always pleasant. SO, WHAT ELSE IS THIS GOOD FOR? I’ve been thinking a lot about Challenge Modes because I absolutely want a set of Righteous Gundam armor, and I think that’s where this build will really shine. There are several encounters where heavy damage can be avoided by a smart group, meaning you can essentially run the dungeon with 3.5 DPS. This build nerfs your healing, but ideally, you should be able to get by on nerfed healing at that level. I’m also really eager to try it out in some battlegrounds, but my priority for now has been getting geared for Waypoint’s raid start next week, so I’m afraid I can’t say much more than that on it. However, the PvP tier set bonuses do look like they’d be fantastic for this. 2pc gives a 10% buff to Holy Shock, and 4pc returns HP back. I consider this build a work in progress, and I imagine I’ll continue to tweak it and discover more about being a hybrid-within-a-hybrid as the expac progresses and I find different ways to use it. My intent was just to be able to level and quest in my stronger gear, I haven’t crunched ***serious numbers*** on it or anything amd don’t plan to; it isn’t a viable spec for raid DPS. Anyway, I welcome feedback on it from anyone else who tries it out–let me know what you find, and I hope you found this post helpful! Salt to taste, see what works. I absolutely agree with everything you’ve written here. As soon as 5.0 hit I respeced my DPS spec into Shockadin (I’m a healer main spec). I’ve levelled every expansion so far as Holy and it’s generally been a slow grind, but except for 89-90 this expansion has been really fun to run in Shockadin. The only issue I’ve discovered was during the 89-90 grind it took forever to kill mobs, and with the fear mechanics and elite adds walking around in Wastes I just ended up getting wrecked all the time. So I chained dungeons for the entire level. It’s good to see someone who has discovered the glory that is the Shockadin!! PVP set bonus and harsh words is sick. Assuming you have divine purpose. Got sent here from WoWinsider… this is an awesome solution to my fear of leveling in holy and my hatred of ret. The on thing you dont mention is stats. Do you reforge differently than you do when in heal mode? @Dazerath I haven’t tried it for any sort of sustained period and I purposely avoided blowing any cooldowns for my timed mob kills (assuming worst case scenario, essentially). Abilities like Light’s Hammer/Holy Prism are obviously going to affect things as well. @Ethan Glad to help! I’ll be honest, I haven’t really considered reforging/stat weights/minmaxing for this build, and don’t plan to. My intent in writing the post wasn’t to recommend some sort of optimized spec; more that I saw a lot of folks in the community feeling frustrated that they had to level or quest as a spec they weren’t fond of–you aren’t the only one who didn’t have any interest in playing ret. I personally really liked questing as prot pre-Mists but that felt like agony with the 5.0 changes, and I didn’t have a lot of interest in playing ret. This seemed like a good resolution to that problem! That said, if anyone feels like doing some sort of thought experiments about stats etc, I’d love to hear what they have to say. But I expect any such theorycrafting/sims/number crunching would probably be little more than an academic exercise. Shockadin is one of those ‘jack of all trades, master of none’ situations, but I think there’s going to be more of a need for that kind of role in Mists than in previous expacs. @everyone else — glad you found it useful! So, I have never tried Holy, much less a shockadin and was thinking of giving it a whirl. Was wondering about one thing. would it be viable to get a spell power blade such as a one hander with stam/int/haste/spell power/mast? Oh and i was thinking of doing this for PvP, not PvE btw. @James I don’t really see why not, but I’m not a theorycrafter. The most I can confidently say is to give it a try and see how it works. Do bear in mind though that hpal mastery affects only healing, not damage dealt. @Arli @James Who’s to say you can’t do both? That’s half the fun of the spec. 😉 Some of your heals are going to be nerfed, but they’re still heals. 1. PvP RESILLIENCE – People are going to hit you in the face. Constantly. Healer = punchingbag. You will find this on all PvP items, but make sure to GEM + ENCHANT for this! 2. Intellect – Gives Crit and Spellpower. Should be on all items! 3. Spirit – For mana regen. If you don’t have trouble with your regen, you can opt out of this on certain items/reforges in favor of the following stats. 5. Crit – When spamming HS and Denounce, crits will be awesomesauce. Also, I’ll be trying out the talent Eternal Flame, so I won’t be using the Glyph of Harsh Words. Simply because I can use EF to stack shields on teammates, although in 2v2 I guess Harsh Words might be a lot more useful (much shorter fights). I’m also leveling as Shockadin, I tried some macros so I can have Avenging Wrath and Divine Pourpose up every time the cooldown resets. The Sacred Shield is a must to chain mobs, I even killed some rare elite mobs along the way. To buff my XP I also queque for Dungeons as pure Holy. The best thing in leveling as Holy is that, besides the glyphs all the equipment is the same. It’s a great spec and we can have a high chance to stay alive with Plate+Shield+Sacred Shield+Stun+heals. Tbh they need to bring the real shockadin back as it was, they sort of did at the beginning of the expansion where we were doing 150k crit holy shocks, but then as usualy they nerf a good thing, bliz never do what the ppl want and this is why people leave the game.. I understand the holy socks were a bit large in damage, but increase its cd or just reduce it a little, not from 150k crit down to 30k crit (thats an extreme nerf), make denounce do about 40k and put holy shock at about 80k crit and make its cd say as long as say an ele’s lava burst, on top of that make it require a judgement on the target to give 100% crit i really wouldnt mind a ele shaman style holy pally as a new spec or shockadin. Just wanted to update that I levelled to 90 using the Shockadin approach. It meant I had the gear to switch to PvP healing with the guild (even 85-90 your heals are good enough to help in world PvP) and my survivability in questing was amazing. Mobs died pretty fast, certainly not noticeably slower than when I levelled my rogue. The rare times I had to corpse run in MoP was usually due to a higher-level player ganking, very rarely to mobs. I have geared up and enchanted my petpally to holy now and will try to level with the spec. I will also have Retribution as a secondary spec so that I can compare the two. I started yesterday in Jade forest and mobs usually die in around 4 hits, but I really hate the lack of AOE so far. The return of the Shockadin!